A elegant Traditional close coupled toilet from period bathroom specialists Old London, ideal for creating a period look in your bathroom. Manufactured using high-grade vitreous china ensuring a quality finish and long lasting durability. Bring a touch of elegance and style into your bathroom with the sublime Richmond collection of sanitary ware. Comes with a 5 year guarantee against manufacturing defects. Blends beautifully with Old London's range of traditional bathroom furniture. 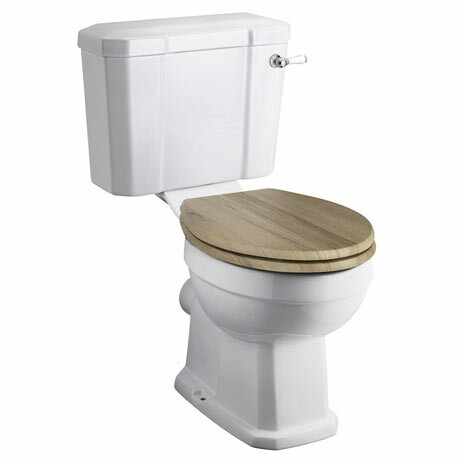 Comes with a top fixing soft closing wooden toilet seat. Q. What is fron of pan to back wall dimension, which side of cistern is water inlet, is it internal overflow, thanks. Hi, the front to the back of the Old London Richmond pan is 684mm. The cistern does have an internal overflow and the inlet is on the left hand side of the cistern. Hope this helps.